A. Szelagowski & Son, 143 Mohr Avenue, was among Buffalo’s best known makers of sausage and smoked meats. The wholesale meat business, whose products were marketed for decades under the “Shelly Brand,” was founded by Anthony Szelagowski in 1899. A native of Poland, he came to Buffalo in 1887 at age 14 to work for his brother Joseph Szelagowski, who operated a meat market on Lovejoy Street (now Paderewski Drive). Twelve years later Anthony went into business on his own, opening a meat market at Broadway near Goodyear and, in 1914, a wholesale sausage plant on Mohr Avenue. 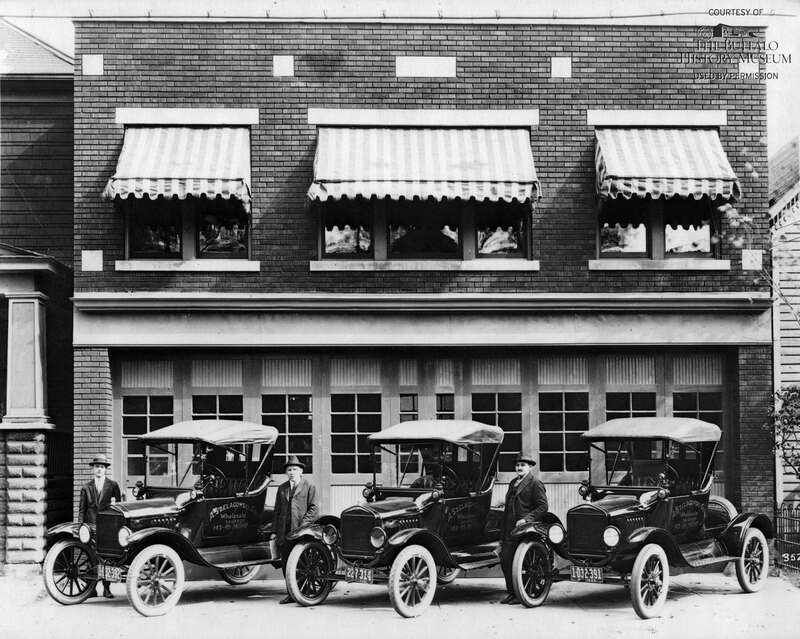 This view, taken by photographer Hauser Bob in about 1920, shows the Mohr Avenue plant, fronted by delivery vehicles and plant executives. Anthony Szelagowski is on the right. The firm grew from a one-person shop in 1899 to a 200-employee, $5 million-per-year business by 1957, when Szelagowski sold the business to Tobin Packing Co. of Rochester. In 1959, the Mohr Avenue facility was closed and a new plant built at Bailey Avenue and Cherokee Place. The original Mohr plant still stands. Shelly Brand hot dogs and bologna are now sold by Wardynski & Sons, which bought the rights to the brand in 2005.